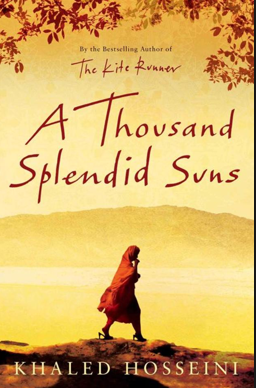 Recently I've been reading 'A Thousand Splendid Suns' which is by Khaled Hosseini. This post is actually a belated one, as technically I finished reading the book a couple of days ago. There are two main characters in the novel: Mariam and Laila, who initially are enemies, but throughout the duration of the book become dear friends. It is through these character's eye we are told the story of the Afghan Civil War, and the effects of its aftermath. The book incorporates various themes some of which include love, romance, arranged marriages, war, gender scripts and domestic violence. I do not want to give too much of the book away, as I actually do want you to read it, so I've been careful to only give details that scratch the surface as opposed to extensive details. Many readers have compared it to The Kite Runner (which is also by Hosseini), saying if you loved that book, then you'll deffo love this one, however I've never read The Kite Runner, but will deffo tell you I loved this book. Have any of you read 'A Thousand Splendid Suns?' or any of Khaled Hosseini's books? If so what did you think of it/them? All content and images © Louise Abena Mensah unless otherwise stated. Site design by Kotryna Bass. Powered by Blogger.